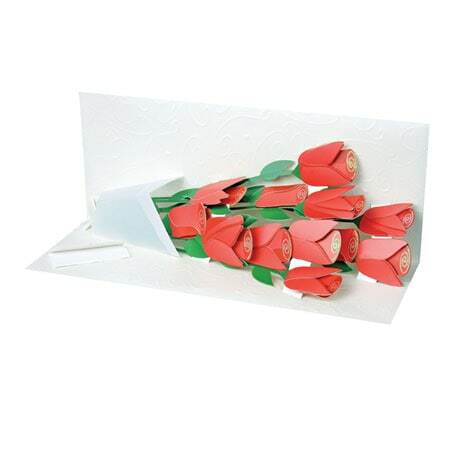 Surprise a sweetheart with a dozen beautiful red roses that will never wilt via our Rose Bouquet Pop-Up Card! The deceptively simple 9¼"x3¾" cream-colored card opens to reveal a fabulous 3D floral arrangement, enhanced with glittering details and accompanied by a tiny "love letter." Open the little envelope to customize the card with a message (choose from "Happy Valentine's Day," "Happy Anniversary," "Congratulations," and blank). Ample room on the back allows for additional sweet sentiments. Envelope included. Extra postage required.